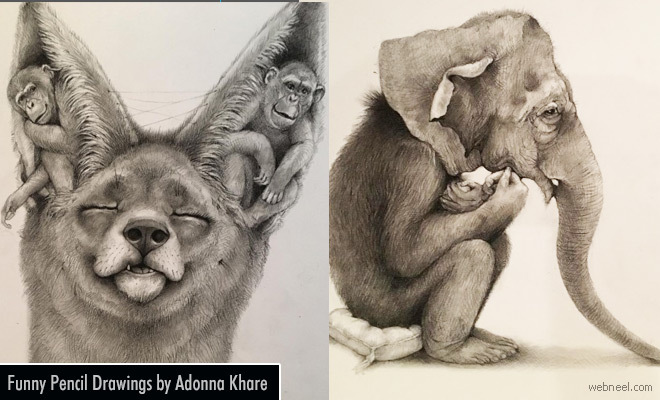 Funny Pencil drawings: Adonna Khare is a talented artist from Southern California. Her prime focus is mostly pencil shade drawings which involves mostly funny drawings of animals. Ever since she was three she has been drawing and her parents have always given her immense encouragement. Adonna completed her Masters of Fine Art from California State University Long Beach. Adonna's work has been collected by prestigious public and private collections throughout the world. She even went on to win the largest art competition ArtPrize in 2012 while competing against 1500 artists from around the world. According to Adonna biography, "A lot of my work deals with the absurdities in life. Juxtaposing predator and prey conveys a change of context, it brings the viewers in to really think about their understanding of not only the animals but those that are around them. The Elephant pieces have to do with the weight that we carry around in our lives. I consider all these beasts of burden, symbolizing the human condition". We absolutely loved the funny pencil drawings and hope you did too.